It isn't all that unrealistic to have significant parking facilities near a convention center that is trying to attract statewide conventions, sporting events etc. Going to lose a heck of a lot of more tax revenue if and when conventions choose other metro options. The City should offer to sell the RiverCenter ramp for someone to buy, operate, rebuild, or redevelop it. Parking is not a legitimate function of government. Convention space is nearly as illegitimate of a public function. I worry about concrete plazas - they can become forlorn, wind-swept zombie lands if there is not enough people wandering around on them. The ideal artificial plaza/ park space in a downtown area, in my mind has sufficient space, greenery, and interest to draw people but not too much empty space to look like abondoned industrial zone. (See Mears park), Why do most European plazas look appealing? Is it because they have nice stone pavers? Or is it they filled with people and have destintations, activities? There's really no natural, environment enhancing part of this plaza, but its covering Shep road, so not loss there. So its main purpose should be to make a pleasant draw for people, activity, unlike a more natural park where protecting nature would be a higher priority. So the focus should be on activating this plaza area, in all seasons. The tiers and planned retail/restaurant spaces are a good start. 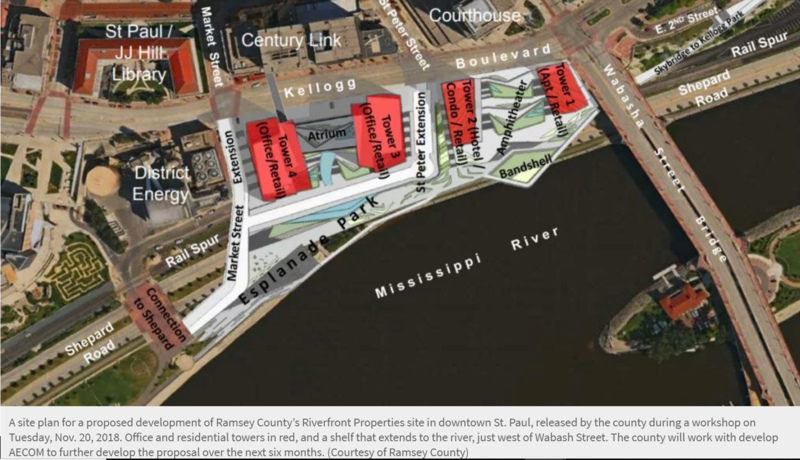 Very appealing connection to downtown and river biking infrastructure with biking centric commercial spot/hub would be great. Kiosks selling things and food would be great. Community, public space for meetings? Music, performance, art spaces? Aecom says the tallest of the four towers, a class-A office building, could be up to 40 stories.